and a whole lot of Christmas cheer. 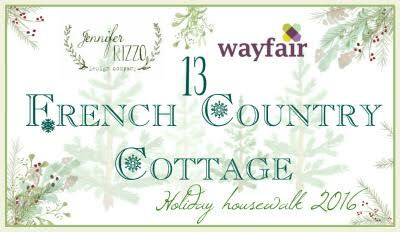 and I am excited to be joining Jennifer Rizzo for the Holiday Housewalk again this year. It is always such an honor to be asked to join such an amazing group of talented bloggers. And something fun- this year we are also partnering up with Wayfair. and her amazing amazing tour- welcome!! I have picked just a few of a couple of spaces to share today. I will be sharing full reveal and detail posts over the next couple of weeks. And I am going to keep talking to a minimum and let my photos do the talking today. 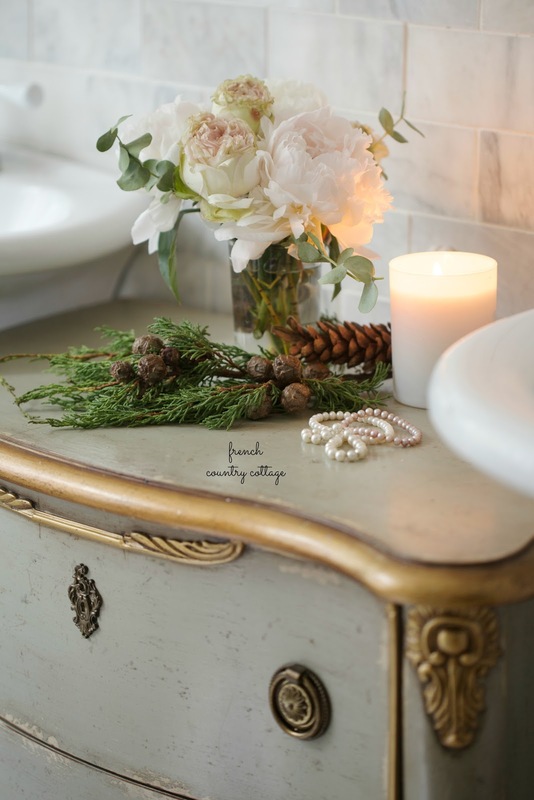 We have been renovating our house and the small guest cottage on our property for several years and have worked to keep as much of the original elements as possible. 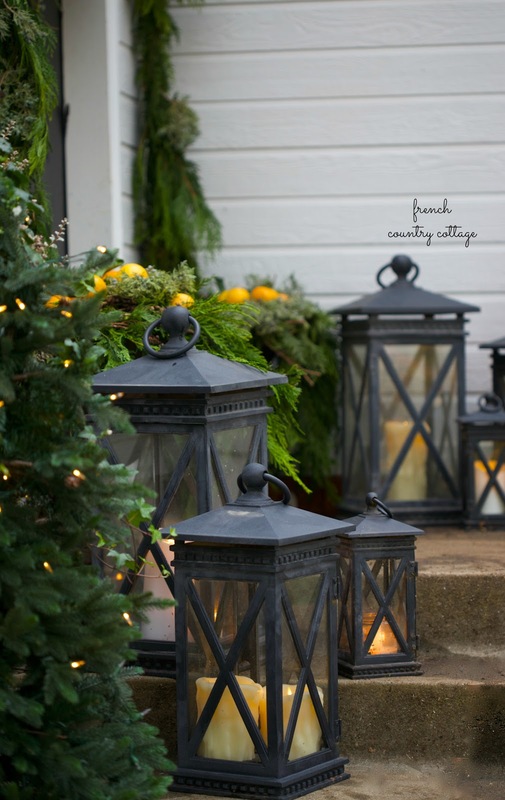 and gather up that rustic cottage charm to mingle with the elegant touches that I love. 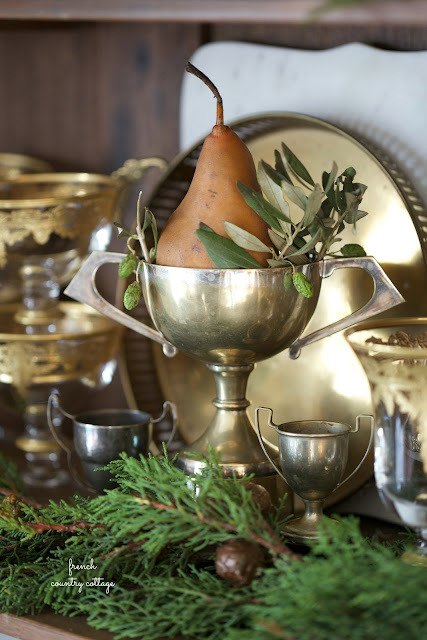 mercury glass, gold and white ornaments. and that rustic bench in the mix. 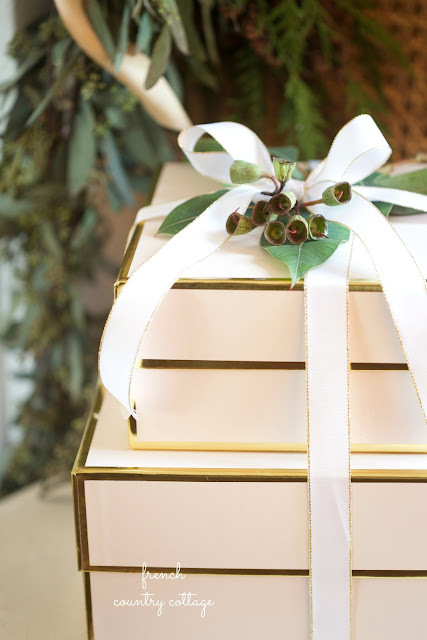 are perfect for presents and for looking pretty. 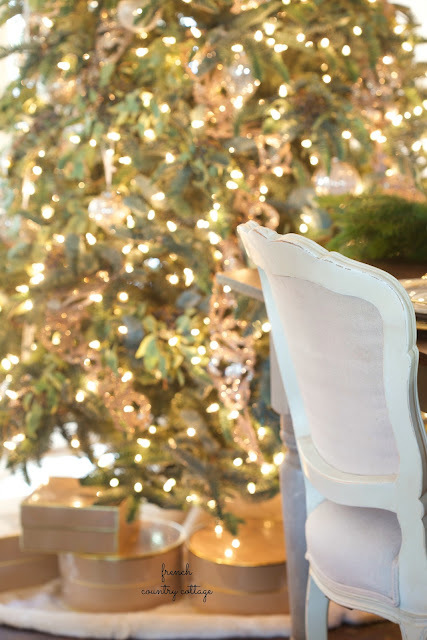 And in the dining room- it is all about simple rustic elegance. 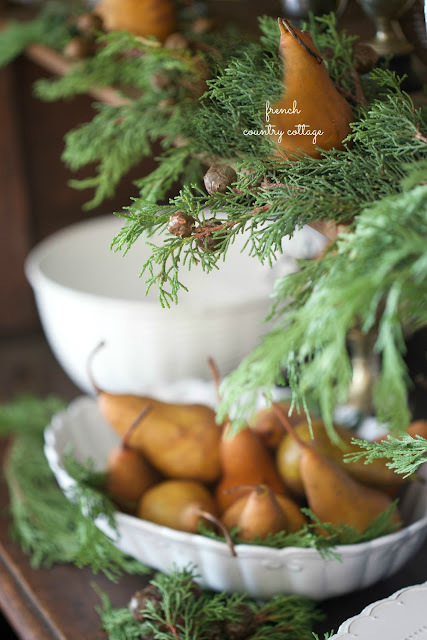 I will be sharing a closer look at this tree soon and the dining room soon. I love how it turned out- and it was inspired by our California wine country. 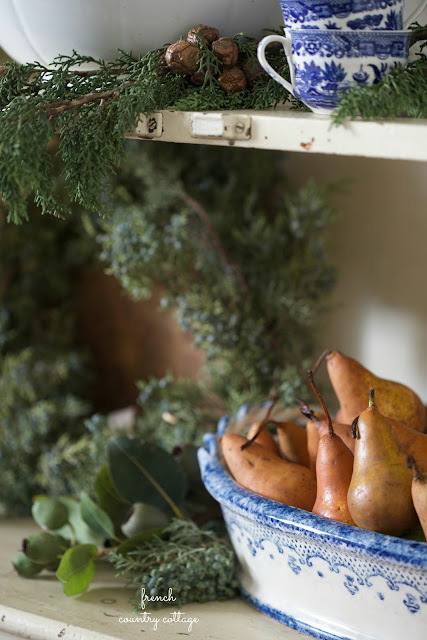 In the kitchen- the vintage hutch has Christmas greens and blue and white. The hutch and kitchen full tour is coming your way this weekend. when it comes to sprinkles of Christmas cheer. 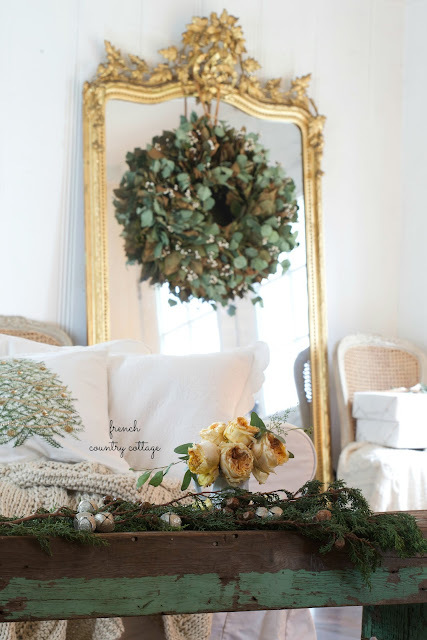 and draped a simple eucalyptus garland with just a couple vintage ornaments across the bed. and it is definitely simple again. 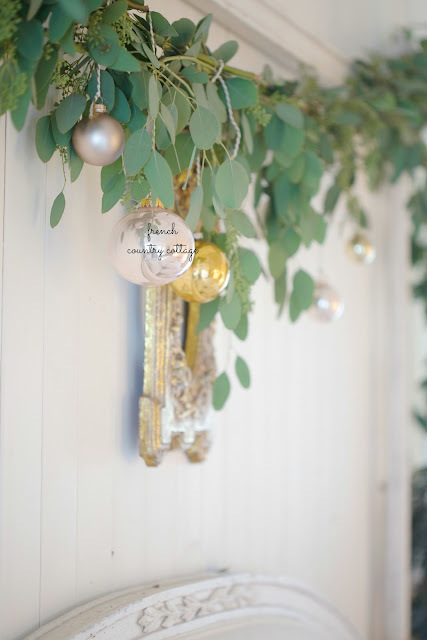 dotted with a few little baubles is perfect. 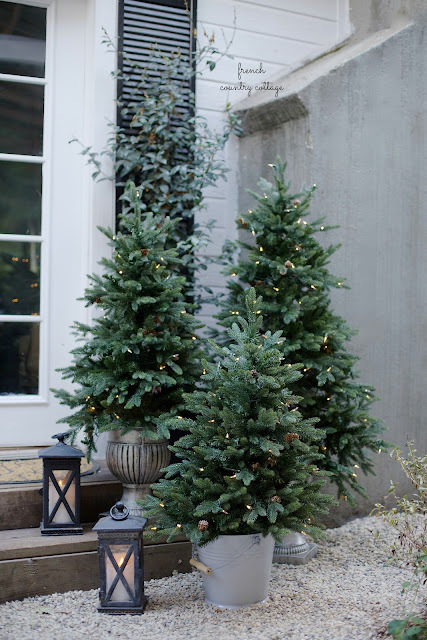 I love this trio of simple outdoor trees wearing nothing but twinkly lights. And the fireplace is getting ready for it's Christmas dress as well. 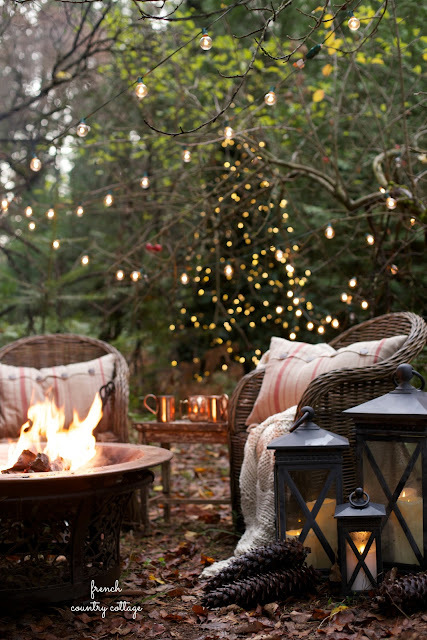 One more stop today- the fire pit in the orchard. I am obsessed with this outdoor Christmas tree and love it out here among the apple trees. 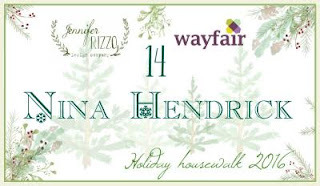 Nina Hendrick- one you won't want to miss. Come back on Friday for the first full room reveal. 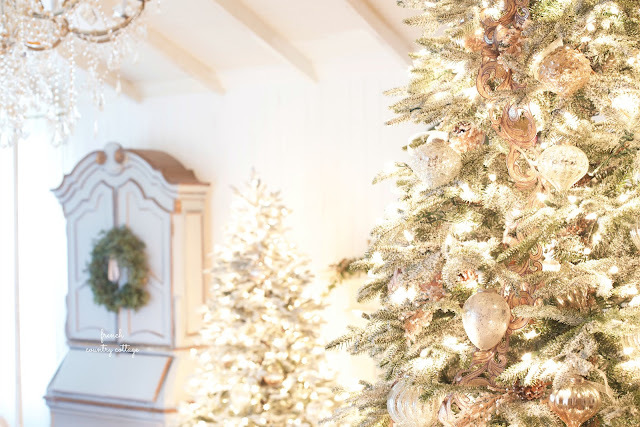 I am Balsam Hill's Amabassador- and have a wee little love affair with all things Christmas and Balsam Hill but this post is not sponsored by them- just sharing the love. 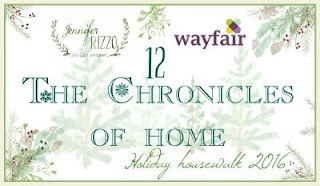 There may be affiliate links, included and Wayfair did sponsor part of the tour- but all opinions and insane love of Christmas is all my own. 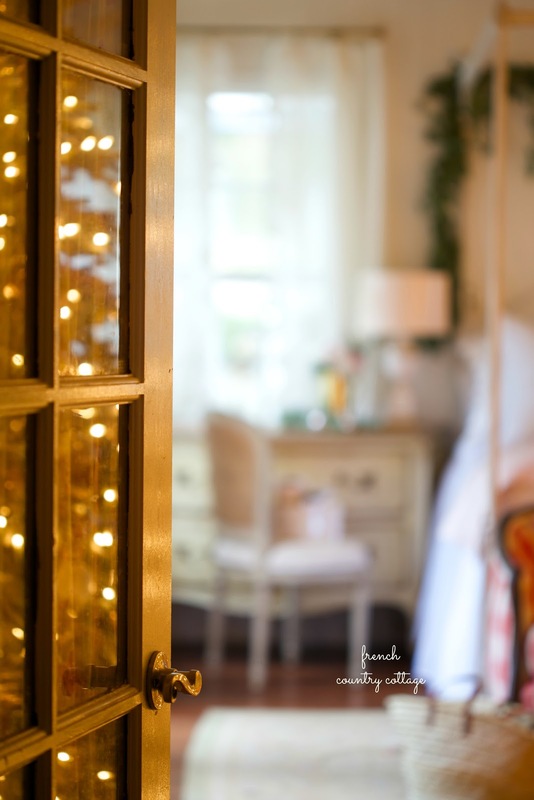 As always, your home positively glows! Merry Christmas! So sweet of you - thank you Ardith! It's so magical and European-like! 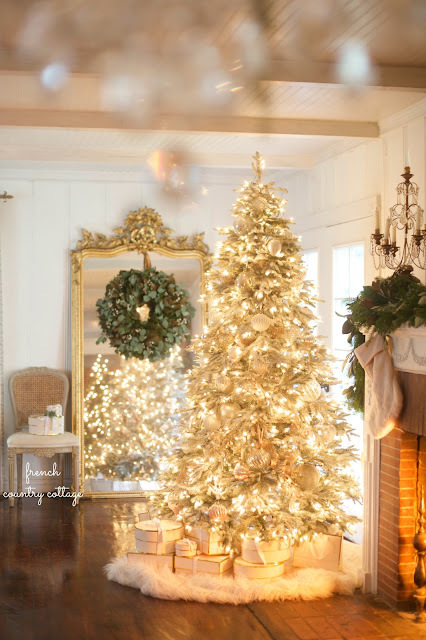 I love your beautiful Christmas cottage. 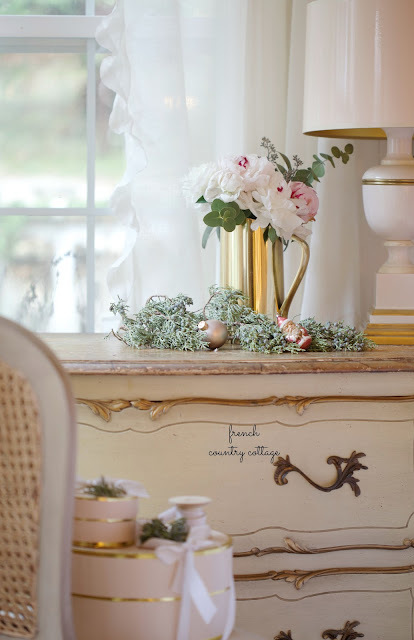 I love the decor! It is just beautiful! 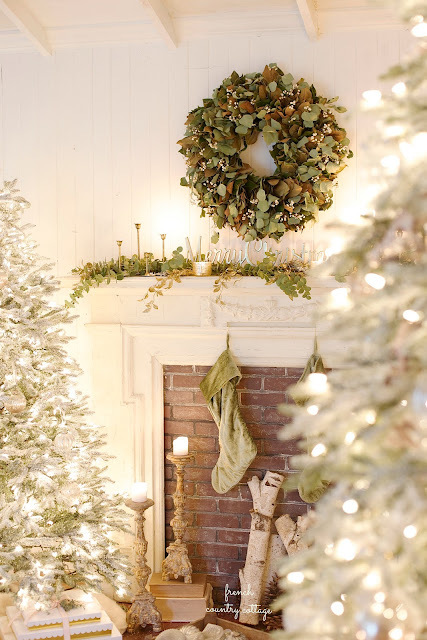 Oh my goodness, I'm inspired and a little obsessed with all your holiday lovliness! You have really outdone yourself this year! Happy holidays, Courtney! Thank you Fabiana!! Merry Christmas! 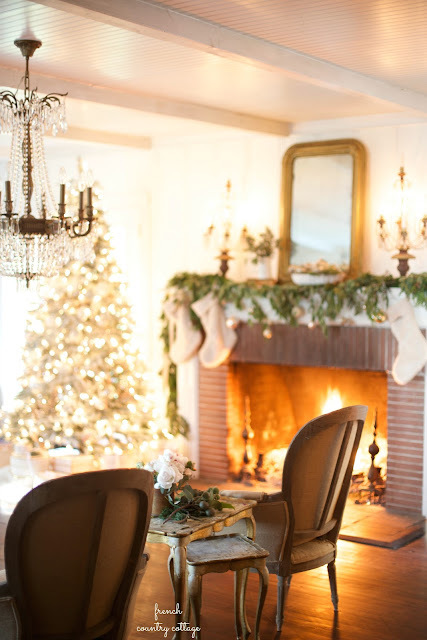 Courtney, your home is always magical at Christmastime. Love every square inch! 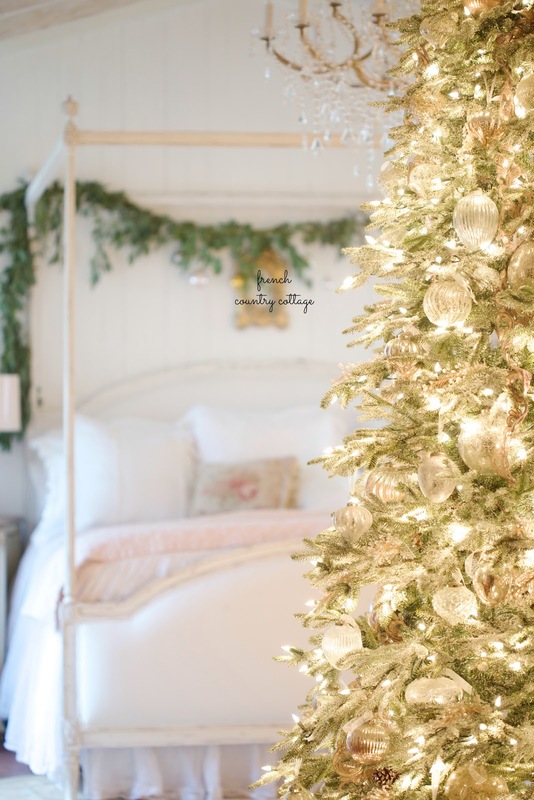 Courtney, your home looks so beautiful and amazing!! Thank you so much for being a part of the tour!!! Thank you so much Jen!! I am so happy to be on this tour with you! Appreciate all your hard work and asking me to join you! I love all of the photos. They are all so pretty and dreamy !! It is all so magical I love it! Courtney I always find myself unknowingly holding my breath as I scroll through your photos because it is all just so stunning! Truly gorgeous and so, so lovely. You never cease to amaze! So sweet of you - thank you so much sweet friend!! Beautiful! 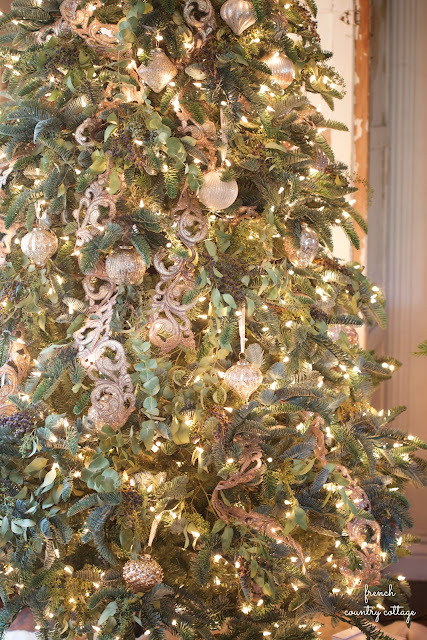 Could you indicate which Balsam Hill Christmas trees you used? Hi Cynthia- the one in the bedroom and in the living room are Frosted Fraser Fir trees. 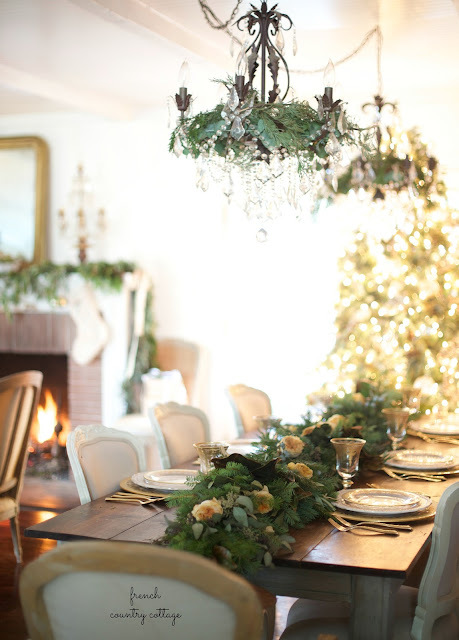 The dining room is a Noble Fir and outdoors on the patio is a Balsam Fir. Hope that helps! So so pretty, I am itching to start decorating here in France, but of course things are slower here, the village and town lights will be turned on either tonight or this weekend, then things start to get festive, I shall be starting too with a few things and then the tree will go up in a couple of weeks, it's a gentle build up and lots of fun! I think it all sounds dreamy and just exactly the way it should be! How special to experience Christmas in France!! I love everything! I saw a lumbar pillow with silver sequins - where did you find it? I love the Christmas tree outside! I love it!!! Your use of mirrors just magnifies the Christmas glow in every room! So beautiful! Thanks for sharing! Truly breathtaking ... the greenery ... the lighting ... the magic and ambiance of it all! Your holiday home truly glows! Beautiful and stunning! 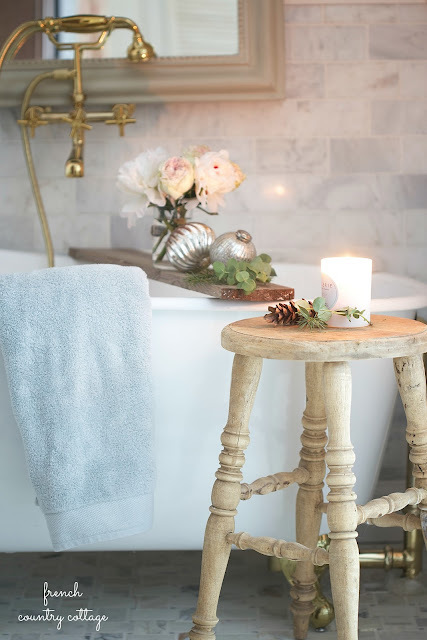 Every room has such classic beauty! 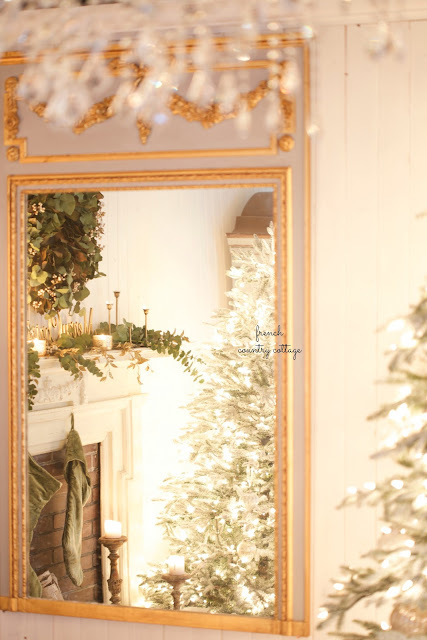 This is an antique mirror that was found on craigslist- but Restoration Hardware sells similar floor mirrors if you are looking for a new one. Hope that helps! I still can't get over that tree and mirror combo. It's perfect in every way! You have such an amazing gift, my friend. I could look at your pictures all day. Thank you Michael! 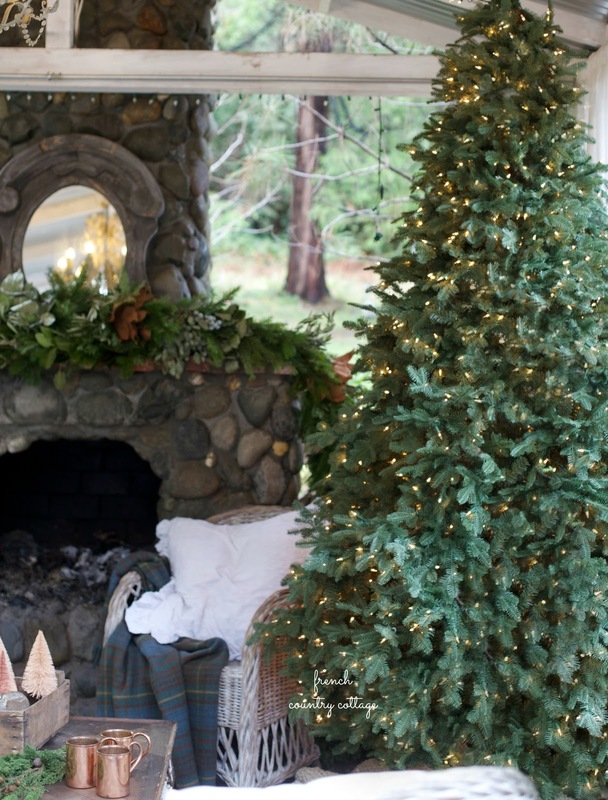 I have a wee crush on both of them too... and I can't get over that stair garland of yours!! AMAZING! I have said this before, your home for the Holidays is in Webster's Dictionary ... under the definition of "Enchanting" ... You know just how to make people smile with great Joy! Courtney I feel like you are in a special category above most. The way you capture Christmas and your home is pure art. 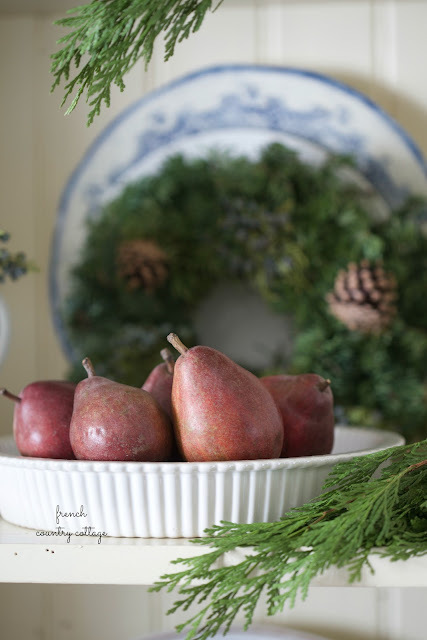 Just wanted to say I love your beautiful photos and decorating style. I've been following you and just saw that you live in our beautiful Napa Valley too. I am working on incorporating some of that beautiful country French charm into our 1975 north Napa tract home. You are an inspiration. Thank you. Courtney the tree and mirror are amazing together, I adore your tour!! I can't wait to see all the details in each room. My style before kids was very similar to yours but I've had to go much more rustic now that I have 5 lively kids! lol. I swoon over your home.